(Bridgewater, N.J., March 9, 2018) - The Somerset Patriots have signed right-handed pitcher Vince Molesky for the 2018 season. Molesky enters his first season with the Somerset Patriots and first in the Atlantic League. The 27-year old spent the first three years of his professional career with the Gateway Grizzlies (Frontier League). Last year, he finished with an 8-7 record and a 3.85 ERA over 21 games (19 starts). He was tied for the league-lead in strikeouts (120) and finished third in innings pitched (128.2) while only allowing 34 walks. The Montoursville, Pennsylvania resident made 18 starts in each of his first two seasons with the Grizzlies (2015-16). Molesky led the Frontier League in strikeouts (110) against just 25 walks in 2016 along with five wins and a 3.70 ERA. Additionally, he earned five wins and struck out 96 batters against 29 walks over 108.2 innings in his first season with the Grizzlies (2015). 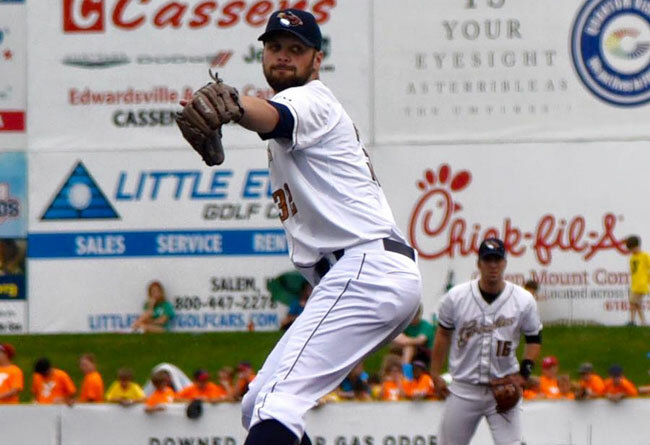 The Mount St. Mary’s alumnus was 18-21 with a 4.19 ERA, six complete games, three shutouts and 326 strikeouts over 57 games (55 starts) in his three-year career in Gateway.